This is the website of the Institute for Gravitational Wave Astronomy at the University of Birmingham, we work with the Astrophysics & Space Research Group in the School of Physics and Astronomy. We are a multi-disciplinary research group that brings together expertise in experimental laser optics, gravitational physics, astrophysics, and advanced theoretical and numerical methods to open a new observational window on the Universe by capturing ripples in the fabric of space-time. LIGO, Virgo, and a partnership of ground- and space-based observatories have announced the first detection of a collision between two neutron stars! Observing colliding neutron stars tells us new information about long-standing questions in astronomy from the composition of neutron stars to the properties of the Universe itself. This historic observation also marks the first time that gravitational waves and light have been observed from a single event: a major step forward in the new era of gravitational wave astronomy. To find out more about this discovery, and the important role played by scientists in the University of Birmingham Institute of Gravitational Wave Astronomy, see our press release. 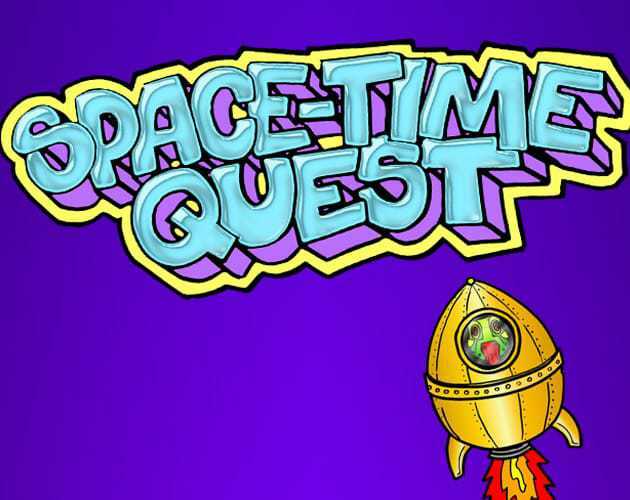 Play our new version of Space-Time Quest, which challenges you to design a gravitational-wave detector. The new version is available on iOS and Android, and is free to play. Can you beat our own LIGO scientists at their own game? The LIGO Scientific and Virgo Collaboration have announced the detection of a new gravitational-wave signal GW170104! The signal originates from a binary black hole coalescence and is the first detection from the second observing run of Advanced LIGO. Results can be found in the paper, which has been published in Physical Review Letters. More information about the discovery can be found in our University of Birmingham press release. We invite applications for a permanent faculty position in gravitational-wave instrumentation and experiments at the Lecturer/ Senior Lecturer/ Reader level. Applications from top researchers in all experimental areas relevant for gravitational-wave astronomy, including quantum optics, interferometry, quantum measurement, metrology and instrumentation are encouraged. The deadline for applications is April 21, 2017. Find out more on our jobs page. We are looking for an experimentalist to join the group for a two-year post-doctoral position, starting this autumn or winter. The deadline for applications is August 30, 2016. Find out more on our jobs page. Members of the group have published papers on a range of topics this month, including multi-band gravitational-wave astronomy, measuring the properties of neutron stars, and testing general relativity with binary pulsars and golden black hole binaries. Find out more from our list of publications. On Wednesday the first results of LISA Pathfinder were published in Physical Review Letters. The results exceeded expectations, to the delight of scientists from Birmingham who were involved in building Pathfinder! This is a significant step toward a space-based gravitational-wave detector. Members of the group have also published papers on multi-band gravitational-wave astronomy, forming binary black holes through stellar evolution or dynamical interactions in globular clusters, and measuring the properties of intermediate-mass black holes. Congratulations to Carl-Johan Haster on successfully passing his PhD viva, and to Dr Ilya Mandel on his promotion to Professor! Issue 8 of the LIGO Magazine is now out and available to download as a PDF. This is a special issue themed around the detection of GW150914, covering all areas from simulating black hole mergers to the commissioning of the detectors. It also features the latest news from LISA Pathfinder. Birmingham Gravitational Wave Group members were involved in both contributing features (with an interview with John Veitch on the discovery, an article on testing general relativity from Walter Del Pozzo, and an explanation of the waveform from Christopher Berry) and editing the magazine (Andreas Freise is editor-in-chief and Hannah Middleton is deputy editor-in-chief). We hope that you enjoy reading it as much as we did making it! Today LIGO announced the observation of gravitational waves 100 years after their prediction by Albert Einstein. As part of the global LIGO Scientific Collaboration, scientists from the University of Birmingham have confirmed a major prediction of Einstein's theory of general relativity through their detection of gravitational waves! On 14th September 2015, gravitational waves from a merging binary black hole 1 billion light years away passed through the Earth and were detected by the twin instruments of Advanced LIGO. The observation was of a binary black hole system whose components had masses of approximately 36 and 29 times the mass of the Sun, which merged to form a new black hole of 62 solar masses. This is the first direct detection of gravitational waves and the first observation of a binary black hole merger. 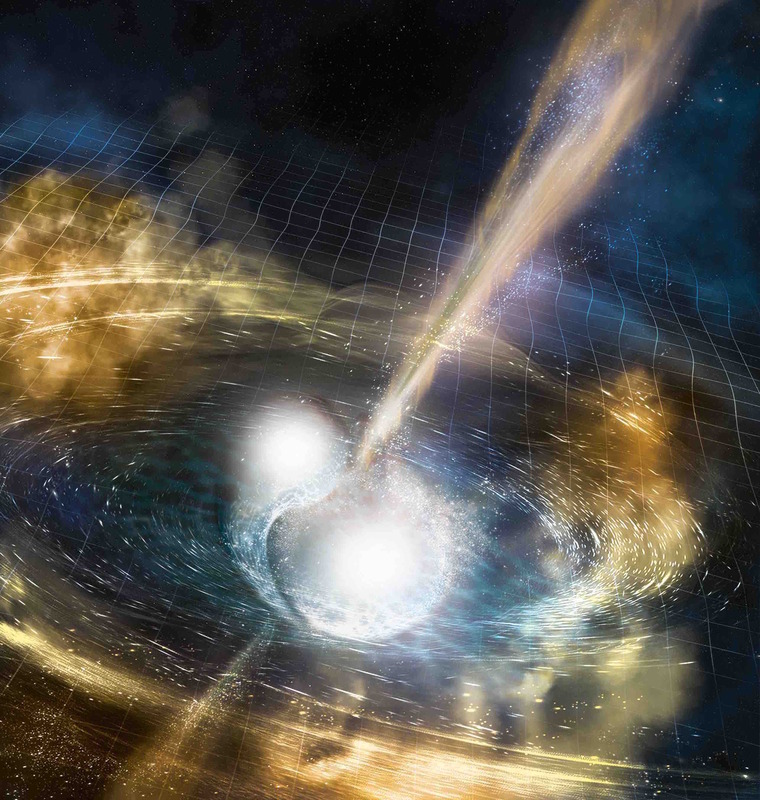 This discovery marks the beginning of gravitational-wave astronomy. To find out more about this discovery, and the University of Birmingham's involvement, see our press release, or come along to our public event. The papers and associated data can be found at the LIGO Open Science Center. Interactive computer apps have been an important part of our outreach activities, ever since 2009 when we developed the first apps for an exhibition at the British Science Festival. We have now founded the spin-off company Laser Labs to update our apps and to bring them to popular mobile app stores (iOS and Android). Our first two apps are now available, try Pocket Black Hole to play with the light bending properties of a black hole and download Stretch and Squash to find our how gravitational waves affect things. The end of the year has been busy with new publications on how to enhance graviational-wave detectors, what we can learn about the evolution of massive black holes from pulsar timing, and the natal kicks of stellar-mass black holes. 'Prospects for Observing and Localizing Gravitational-Wave Transients with Advanced LIGO and Advanced Virgo', which lays out the observing scenarios of the advanced gravitational-wave detectors, has also been updated. It has not all been hard work though, Alberto Vecchio and Andreas Freise have featured in a video highlighting the research we do in the Gravitaional Wave Group. LISA Pathfinder successfully launched at 4:04 am GMT this morning. The ESA mission is designed to test the technology needed for a space-based gravitational-wave detector. These experiments will begin in around 10 weeks, once the satellite reaches the L1 point. We offer congratulations to the ESA Operations team, and wish the team the best of luck for the up-coming work. Find out more about the University of Birmingham's involvement in the LISA Pathfinder mission. Congratulations to PhD students Kat Grover and Will Vousden on who have successfully completed their PhD studies! UPDATE 18 November, 2015: Congratulations to Daniel Brown who has also passed his PhD viva! While we are celebrating PhD students coming to the end of their studies, we are also pleased to welcome new students. Sam Cooper, Siyuan Chen, Sebastian Gaebel and Alejandro Vigna-Gomez are members of our Gravitational Wave Group. In other news, we have some new publications (including papers on measuring the properties of supermassive black holes with pulsar timing arrays and intermediate-mass black holes with LIGO and Virgo), see our list of publications and science summaries for details. The Birmingham Gravitational Wave Group expects to fill several Ph.D. positions starting in Autumn 2016. We encourage applications to pursue projects in any of the research areas of the group (experiments, astrophysics and observations), working with Prof. Andreas Freise, Dr Ilya Mandel, Dr Haixing Miao, Dr Conor Mow-Lowry, Dr Alberto Sesana, Prof Alberto Vecchio, and Dr John Veitch. Studentships are assigned on a competitive basis within the School of Physics and Astronomy and, where relevant, the University of Birmingham. In addition to studentships funded by research councils, this year additional funding opportunities are available for outstanding candidates through special programs. Please see the jobs page for more details. Amid all the excitement of Advanced LIGO starting observing, we have recently had several papers published on topics ranging from pulsar timing to the tidal disruption of star around massive black holes. We have updated our list of publications, and to find out more about our papers, you can read our science summaries. This year marks the 100th anniversary of Einstein's general relativity, our best theory of gravity. General relativity is central to much of modern astrophysics, including gravitational-wave astronomy. To celebrate, the Astrophysics & Space Research Group is running a special season of their public Astronomy in the City events. Each evening will feature a themed talk, covering an aspect of general relativity, including the most violent explosions in the Universe, the mysterious dark energy and Nature's biggest black holes. The first is October 14 when Christopher Berry will give an introduction to Einstein's greatest idea. Subsequent events will be November 25, January 27 and March 9. As of 4 pm this afternoon, Advanced LIGO has begun its first observing run (O1), marking the formal start of the advanced-detector era of gravitational-wave astronomy. The two Laser Interferometer Gravitational-wave Observatory (LIGO) detectors have been carefully upgraded over the last seven years, to reach greatly enhanced sensitivity. Having gone through several engineering runs, the detectors (located in Hanford, Washington and Livingston, Louisiana) are now collecting data and looking for astrophysical signals. The event rate for such gravitational waves is uncertain, so we will have to wait to see what we will find. After around three months of observing, the detectors will again be taken off-line for further upgrades before the second observing run next year (hopefully joined by Advanced Virgo). Researchers from Birmingham are involved in both developing the Advanced LIGO instruments and in analysing the data collected. We are extremely excited about the discoveries awaiting us! LIGO is designed and operated by Caltech and MIT, with funding from the National Science Foundation (NSF). Advanced LIGO is funded by the NSF with significant contributions from international partners, including: in the United Kingdom, the University of Glasgow, the University of Birmingham and Cardiff University funded by the Science and Technology Facilities Council; the Max Planck Institute for Gravitational Physics, the Albert Einstein Institute, the Laser Zentrum Hannover, and the Leibniz Universität Hannover in Germany; an Australian consortium of universities, led by the Australian National University and the University of Adelaide, and supported by the Australian Research Council. 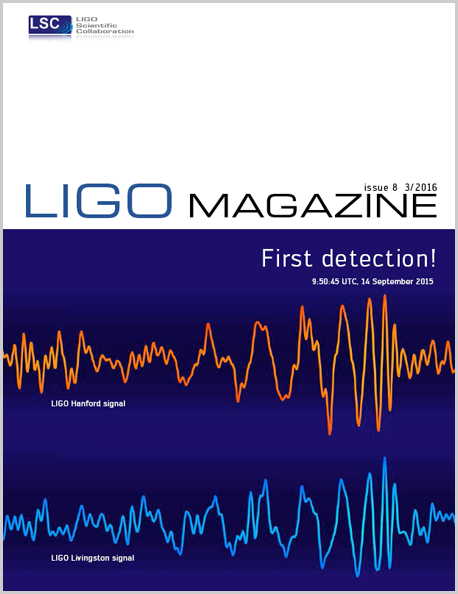 Issue 7 of the LIGO Magazine is now out and available to download as a PDF. This issue's theme is how gravitational-wave observations can complement traditional electromagnetic astronomy. It also features an interview with Nobel Prize winner Joseph Taylor, Jr.
Birmingham Gravitational Wave Group members were involved in both contributing articles and editing the magazine, so we hope that you enjoy it. The Royal Society, STFC and European Commission have schemes for highly prestigious personal fellowships with deadlines in August/September 2015. Over the years we have been successful in supporting strong candidates to receive these fellowships to be held within our group. Those who wish to apply for the current round can find details about eligibility, application procedures and closing dates here. We have updated our website to include a list of recent publications by members of the group. For selected papers, we have also started to compile science summaries, which give a brief introduction for non-specialists. We hope that they are an enjoyable read. This week we have been proud to host the 15th British Gravity (BritGrav) Meeting. There were 50 science talks across two days, plus a public lecture by Prof. Jim Hough. Presentations and posters are available online. We have collected together stories connected to the science talks for those who missed out, and organiser Christopher Berry has written a blog post about the meeting. We thank the Institute of Physics and Classical & Quantum Gravity for their sponsorship, and all who attended for making it such a successful meeting. The gravitational wave group at the University of Birmingham has an opening for a fully funded PhD student in gravitational wave astrophysics starting Autumn 2015. The Birmingham Astrophysics and Space Research group are active in the full range of gravitational wave science, from ground-based advanced detectors to pulsar timing arrays. Our research covers instrumental science, data analysis and astrophysics of gravitational wave sources. The group has expanded in recent years and now has 6 faculty, 2 research fellows, 5 postdocs and 13 PhD students. We are seeking an excellent student for a PhD project in the data analysis and astrophysical interpretation of gravitational waves from coalescence of compact binaries (black holes and neutron stars). This position has funding for full-time research for 3.5 years, including full coverage of tuition fees for students of any nationality plus an annual stipend. Please apply online. The screening of applications will begin on Feb 15th and continue until a suitable candidate is found. For more information contact Dr John Veitch. Recently published in CQG, this article by Moore, Cole and Berry explains some of the conventions used in gravitational-wave astronomy to characterise the sensitivities of detectors and the amplitudes of signals. Several different conventions are commonly in use (which can lead to confusion), each with their own beneficial properties. Accompanying this article is a website where you can create your own sensitivity-curve plots featuring a range of detectors and sources: rhcole.com/apps/GWplotter/, an example is shown on the left. This uses the characteristic strain, so that the area between the detector's curve and the top a source box indicates how loud that signal would be. Dr Chiara Mingarelli (now a Marie Curie Postdoctoral Scholar in Astrophysics at Caltech) and Dr Charlotte Bond (for now a STEP postdoc in the group) have successfully defended their PhDs. Congratulations! We are excited to welcome Jim Barrett, Daniel Toyra, Anna Green, Serena Vinciguerra, and Gareth Thomas, who are joining the group this autumn. The article The First Two Years of Electromagnetic Follow-Up with Advanced LIGO and Virgo by Singer et al. has been accepted for publication in ApJ. The article The effect of small inter-pulsar distance variations in stochastic gravitational wave background searches with Pulsar Timing Arrays by Mingarelli and Sidery has been accepted for publication in PRD. The article Testing general relativity with compact coalescing binaries: comparing exact and predictive methods to compute the Bayes factor by Del Pozzo et al. has been accepted for publication in CQG. The article Design study of the KAGRA output mode-cleaner by Kumeta, Bond, Somiya has been submitted. The article A CMB-based approach to mapping gravitational-wave backgrounds: application to pulsar timing arrays by Gair et al. has been accepted for publication in PRD. The article TIGER's tail: Testing the no-hair theorem with black hole ringdowns by Meidam et al. has been submitted. The article A more effective coordinate system for parameter estimation of precessing compact binaries from gravitational waves by B. Farr et al. has been published in PRD. The article Double Compact Objects III: Gravitational Wave Detection Rates by Dominik et al. has been submitted. The article Fluorescence detection at the atom shot noise limit for atom interferometry by Rocco et al. has been submitted. We have two further PhD positions in gravitational-wave related projects this year. The positions are funded by the European Marie Curie Initial Training Network GraWIToN (http://www.grawiton-gw.eu/ ) and provide very attractive salary and mobility opportunities. Only non-UK candidates are eligible, no previous experience with gravitation-wave projects is required. The closing date for applications is 23.05.2014. Informal enquiries may be addressed to Andreas Freise and Ilya Mandel (contact info). To download the details and submit an electronic application online, please go to http://www.hr.bham.ac.uk/jobs and quote the Job References 52271 or 52272. A plot from the article "Comparison of gravitational wave detector network sky localization approximations", by Kat Grover et al., which was recently published in PRD, has been selected for the PRD Kaleidoscope feature. The article "The Formation and Gravitational-Wave Detection of Massive Stellar Black-Hole Binaries", by Belczynski et al., has been submitted . The cover article on Black Holes of the March 2014 issue of National Geographic lists Ilya Mandel of the University of Birmingham as one of the sources. The article "Measuring the spin of black holes in binary systems using gravitational waves", by Vitale et al., has been submitted. The article "Parameter estimation on compact binary coalescences with abruptly terminating gravitational waveforms", by Mandel et al., has been submitted. Comparing Finesse simulations, analytical solutions and OSCAR simulations of Fabry-Perot alignment signals by Ballmer et al. Reconstructing the sky location of gravitational-wave detected compact binary systems: methodology for testing and comparison by Trevor Sidery et al. A "video-paper", The generation of higher-order Laguerre-Gauss optical beams for high-precision interferometry by L. Carbone, P. Fulda, C. Bond, F. Bruckner, D. Brown, M. Wang, D. Lodhia, R. Palmer and A.Freise, has been published in J. Vis. Exp. The paper Comparison of Gravitational Wave Detector Network Sky Localization Approximations by Grover et al. has been posted. The paper Sensitivity of intra-cavity filtering schemes for detecting gravitational waves by Mengyao Wang, Haixing Miao, Andreas Freise, Yanbei Chen has been posted. The paper Basic Parameter Estimation of Binary Neutron Star Systems by the Advanced LIGO/Virgo Network by Rodriguez et al. has been posted. The paper Double Compact Objects II: Cosmological Merger Rates by Dominik et al. has been accepted by ApJ. The paper Inadequacies of the Fisher Information Matrix in gravitational-wave parameter estimation by Carl Rodriguez, Benjamin Farr, Will Farr, and Ilya Mandel has been accepted by PRD. Charlotte Bond has been awarded a Mary Bradburn Scholarship by the British Federation of Women Graduates (BFWG). These competitive scholarships reward academic excellence and are open to women from all areas of academia. Ben Farr won the Blue Apple award for the best talk at the Midwest Relativity Meeting at the University of Wisconsin -- Milwaukee, USA. 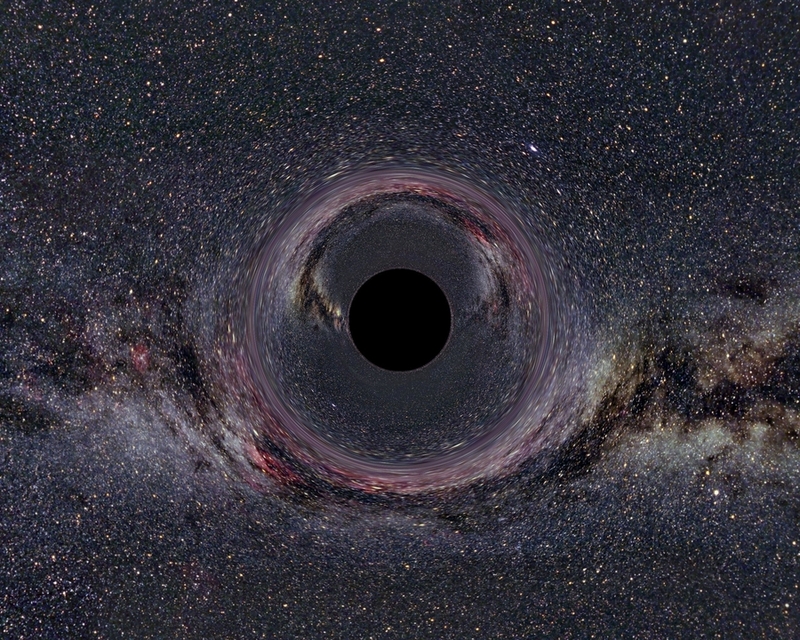 The Birmingham Gravitational Wave Group expects to fill several Ph.D. positions starting in Autumn 2014. We encourage applications to pursue projects in any of the research areas of the group (experiments, astrophysics and observations), working with Prof. Andreas Freise, Dr Ilya Mandel, and Prof. Alberto Vecchio. Studentships are assigned on a competitive basis within the School of Physics and Astronomy and, where relevant, the University of Birmingham. In addition to studentships funded by research councils, this year additional funding opportunities are available for outstanding candidates through special programs. Please see the jobs page for more details. Several people have joined the group or were promoted recently. Prof. Alberto Vecchio is now head of the Birmingham Astrophysics group. Dr Andreas Freise is now Professor Andreas Freise. Dr. Will Farr has permanently joined the group after earning the prestigious Birmingham fellowship. Dr Walter Del Pozzo joined as a postdoc, with Christopher Berry about to follow suit, while Ben Farr is a 1-year visitor. Meanwhile, Dr Frank Brueckner, Dr Ludovico Carbone, Dr Deepali Lodhia, and Dr Rory Smith recently left the group for other academic (postdoc) or industry positions. Interferometer responses to gravitational waves: Comparing FINESSE simulations and analytical solutions by Charlotte Bond et al. Characterising gravitational wave stochastic background anisotropy with Pulsar Timing Arrays by Chiara Mingarelli et al. Rapidly evaluating the compact binary likelihood function via interpolation by Rory Smith et al. The Transient Gravitational-Wave Sky by Andresson et al. Finesse, Frequency domain INterferomEter Simulation SoftwarE by Andreas Freise et al. Phase effects due to beam misalignment on diffraction gratings by Deepali Lodhia et al. A realistic polarizing Sagnac topology with DC readout for the Einstein Telescope by Mengyao Wang et al. Generation of high-purity higher-order Laguerre-Gauss beams at high laser power by Ludovico Carobne et al. Invariance of waveguide grating mirrors to lateral displacement phase shifts by Daniel Brown et al. Studies of waveform requirements for intermediate mass-ratio coalescence searches with advanced detectors by Rory Smith et al. Counting And Confusion: Bayesian Rate Estimation With Multiple Populations by Will Farr et al. Andreas Freise was awarded the "Excellence in Doctoral Supervision Award" for the college of University of Birmingham Engineering and Physical Sciences. The nomination process not only involves letters of recommendation from current students, but past students and the chair of the department as well. This is a highly competitive award in the University, as both the nominee and the nominator receive a 1000 pound prize. Chiara Mingarelli was awarded a Universitas 21 Scholarship to study new tests of General Relativity with Prof. Ingrid Stairs of the University of British Columbia. For more information please contact Miss Katherine Grover, Doctoral Researcher in the Gravitational Wave Group: Email: kat@star.sr.bham.ac.uk Phone: 01214143721. Look here for information on how to find us. For information on National Science and Engineering Week visit www.britishscienceassociation.org/national­science­engineering­week.For more information on the University Science and Arts Festival visit www.birmingham.ac.uk/artsandsciencefestival. The Gravitational-Wave Group at the University of Birmingham invites applications for a post-doctoral position in the area of gravitational-wave astrophysics and data analysis, with emphasis on compact-object binary systems. More details can be found here. For full consideration, candidates must apply online and arrange for three letters of reference to be sent by the closing date of Tuesday 27th Febraury 2013 to postdoc-gwastro [at] star.sr.bham.ac.uk . The University of Birmingham's College of Engineering and Physical Science has published a feature article on GW group member Chiara Mingarelli. Chiara has recently been named runner up for the Institute of Physics and Shell's "Very Early Career Woman Physicist Prize 2012". The prize is awarded annually to a candidate who has shown leadership in her field and has demonstrated commitment to excellence in both her research and outreach activities. Graduate student Rory Smith, mentored by Dr Ilya Mandel, led an international collaboration to demonstrate that waveforms interpolated via singular value decomposition can be successfully used for parameter estimation on gravitational waves from compact binaries. This technique has great promise for speeding up parameter estimation on long-duration signals in the era of advanced and third-generation detectors. The US-based Laser Interferometer Gravitational-Wave Observatory (LIGO) is supported by an international group of more than 800 scientists from about 80 institutions, the LIGO Scientific Collaboration (LSC, http://www.ligo.org). Birmingham is contributing to the development, operation and science exploitation of Advanced LIGO, the most sensitive, kilometer-sized gravitational wave observatory in the world. The group reports on the development of integrated sensors, actuators and the related read-out and drive electronics for the control of the Advanced LIGO suspensions in a paper by Ludovico Carbone et al. published in Classical and Quantum Gravity. Chiara Mingarelli et al. published a Physical Review Letter showing that gravitational waves from massive black hole binaries detected with pulsar timing arrays can yield direct information about the masses and spins of the black holes. Ilya Mandel contributed to an arXiv pre-print analysing the future fate of Galactic X-ray binary Cygnus X-3, which is likely to form a merging binary black hole or neutron star - black hole binary.